← Hey Bub, can you lend me some support? Back when I was in college there was an iris farm not far from where we lived. Going to school in the snow belt of upstate New York, things like The Lilac Festival and iris farms were one step more magical than they would normally be for their juxtaposition to the brutal snow dumping of the long winters. It was always so hard to reconcile all that color after living in a gray and white world of visual deprivation for such a long period of time. An odd place to go to art school, indeed. Growing up in the more populated west end of Long Island, iris farms were not something I had ever seen. One late spring morning I came across one and had to pull over. It was like a floral candy store; rows and rows of the these elegant multi-colored flowers. On some level a flower farm seemed comical. You know, being downstate suburban jaded and all. But it was also enchanting. Every year after that I made sure to stop by this farm for the sheer joy of walking down rows of blooming irises. 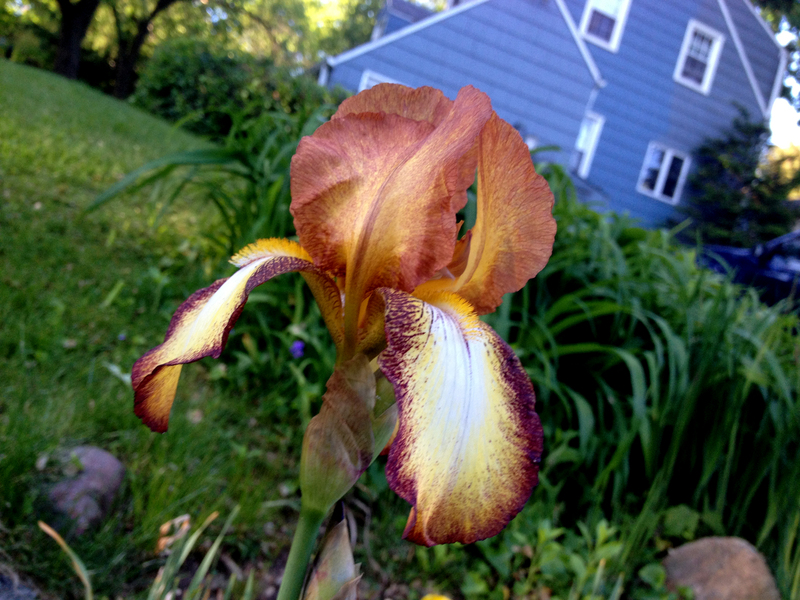 The other morning on my walk I realized that all the irises in the neighborhood were starting to bloom at once. This particular solitary flower took my breath away and gave me a strong flashback of the upstate iris farm. From the angle of the shot it looks like I had fallen down and was shooting from the ground. No worries, I was upright. (for those who know me that is not too far-fetched) Dog leash in hand, I was still able to capture this one perfectly. I love the color of the house behind it as a backdrop. The point of this post? I guess it is the same as the point of my morning walk everyday. To stop and take pictures of the flowers. Wait isn’t that stop and smell the roses? No, it is wake up and smell the coffee. Actually… it is all of them. There’s a circular plot of irises just down the street from us that’s in full bloom right now. It’s one of my favorite sights. Here’s a photo I took of it a few years back. I would love to visit an iris farm. very nice! Would love to see that farm, too!